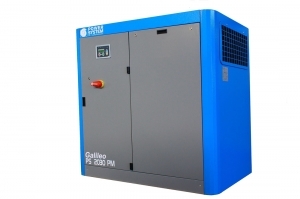 The new Galileo range of variablespeed air compressors from FPS Air Compressors is reported to represent a significant step in maximising energy efficiency. Manufactured by Power System Group, the new machines differ from standard variable speed compressors by using direct drive, permanent magnet motors and sophisticated controls to bring gains in energy efficiency. The new compressors are based on the proven PS-DV Series platform of variable-speed compressor with highly efficient compressor air end, direct drive and sophisticated controls. But the adoption of a new generation permanent magnet motor brings further gains in energy efficiency of around 9-12% when compared to other variable speed compressors. It is possible to connect to external control, monitoring or visualisation software or even business manage - ment applications via a LAN, serial interface or web-connected modem.